Sometimes we don’t know what is going to provoke us to think deeply about ourselves, our lives and human beings. Sometimes one sentence is enough to move your being deeply enough and provoke you to commit a short article. The above-mentioned quote is for me a bit pointless and contradicts itself, because no matter how you look at it, our flaws and virtues that we all have obviously… are the components of our character. And human deeds, and the appearance, manners, dressing, etc. come precisely from human character. Someone may accuse me by saying that sometimes we do what we have been told to do, not what we really want to do. Well, yes, that’s the fact, sometimes it happens, but is it nothing but a testimony of our character and its weakness … lack of possibility of making limits and boundaries … surrendering to someone’s will, it is nothing but the image of our character. 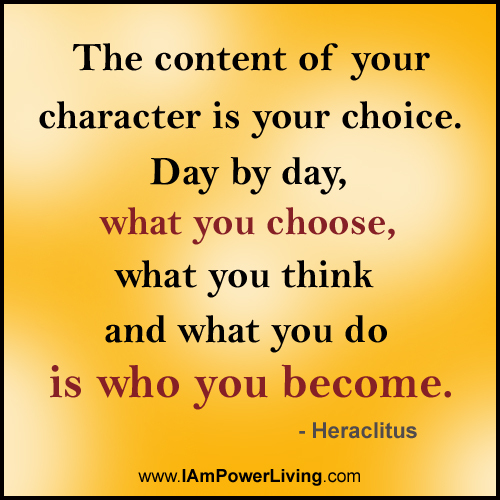 The image that not always is about our weakness, but anyway always is about our character. It is indispensable for me to think that such sentences as those mentioned above, are made up by people who do not think what they are doing and what the consequences it will bring. And later they try to excuse themselves … but I wanted good … well, there is a very wise polish saying that ‘the hell is paved with willingness of goodness’; and in my opinion the thoughtlessness in speaking and doing is unfortunately the cause of human misfortune for many thousands of years. Moreover, this is what all the greatest spiritual teachers say about, to stop being a mindless lamb, and become a conscious and thinking individual and above all responsible for his/ her action. That is real humanity. And yes, mistakes happen, occasionally, but if it’s a one in a while thing, and in fact at every other moment in your life you are guided by consciousness, wisdom and love … let’s just be honest … this little mistake can’t cover the whole character of the person, the character of the conscious person. Besides, the other issue is that nothing happens without a reason, and everything in the universe happens for all intentions will meet up. It is also one of those things that some certain people like to put the blame on for their stupid and unpleasant games. Yes, it is true that the intentions get along … but YOU take care that YOU do not play out unconscious puppet in your or others life. To very conscious people, it can happen just as it happened to me in the moment of higher consciousness, that I saw clearly that a person provokes to shout out at her … moreover, I knew that nothing else would works … and indeed, I have been consciously raising my voice in such a situation … but it was just raising my voice … not emotion … this reminds me of a such moment in a movie ‘The Lord of the Rings. The fellowship of the ring’ when Bilbo being reprimanded several times by Gandalf to give back the ring, he stood up and denied. Until finally in this one phenomenal scene, Gandalf is raising his voice, reproving his friend, with all his silhouette rising, which is clearly on purpose, restoring Bilbo to his healthy senses. A moment later, Gandalf returns to his role of a loving and understanding friend. But this scene shows in my opinion, those moments when we can consciously scold someone for a moment to restore a healthier perception of reality, to help to that someone to let go of grasping their own pride and arrogance. So, it happened to me once or twice, to be such Gandalf for someone, too. However, we should distinguish the conscious rebuke of the other person, as a friend … from the commonplace in social categories, screaming at each other, without any reflection or awareness, playing only the role of executioner or victim. I am not sure if all the readers will understand what I mean. Probably there will be some who want to criticize these ideas just for the art of criticizing … but remember that your behaviour does not testify of who I am, only of who you are indeed. And try to remember this wisdom, always and everywhere, because this awareness will help you to improve yourself as well as striving to be a better version of yourself. And yes, I do believe that good people will do everything to do good … and again, what a big topic … because in this world, the word ‘good’ like everything else is a very relative concept. Well, by shortening this paragraph to a minimum I only say that I am talking about the so-called Highest Goodness. Another category of people who make up the above-mentioned sentences are people who do not think too much about what they say. And again, they want to justify themselves, that what they say is not really about their character. Well, dear little bees, your character, is very much about what you speak out about. Regardless of how you would like it to be, what you speak out is what you send out. 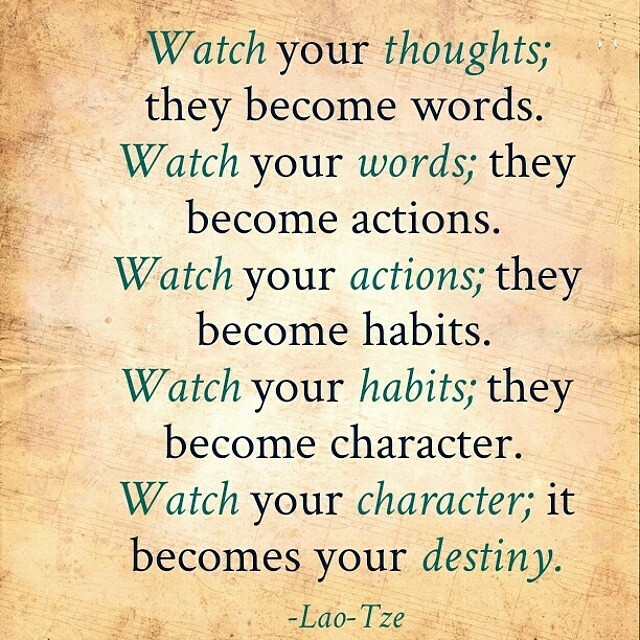 Just like your deeds, and your deeds come from your words and thoughts, and all together do represent your character. I think, that to this, mentioned above quote, should be easily attached and liked by victim patterns, which is commonly found in Polish society. And this is something that should be worked over, as it is called in the jargon of people developing their consciousness. So, take a closer look at these behavioural patterns, expose them and change them. Unfortunately, this will not happen itself, and only conscious work on your character can cause a change in your behaviour and vice versa, a conscious change in your behaviour will permanently reform your character. It’s a bit like hewing a wood stump. Sometimes it is hard and long-term work, but every hit, every conscious change in your behaviour, deforms the trunk and contributes to its better final effect. At the same time, the structure of the trunk, which means something that determines how easy it is to be sculpted, is simply the structure of your own character and your motivations, means whether we are flexible in changes, or whether we want to change. Another issue is that judging is a very bad and harmful habit, and, in the process of developing consciousness, we should give it up, eventually. Simply judging does not get alone with love and wisdom. Because a person who is very much aware, and guided by love and wisdom knows that EVERYTHING has its own meaning, purpose, reason, cause, etc., the aware person knows that judging the other, is same as judging yourselves; the aware person knows that from your narrow perspective you know as much as nothing about the other person and judgement is not proper, at least; the aware person knows that by judging, you send negative energy to the other person, and thus in the final effect you send it to yourself, because what we send out is always coming back to us.